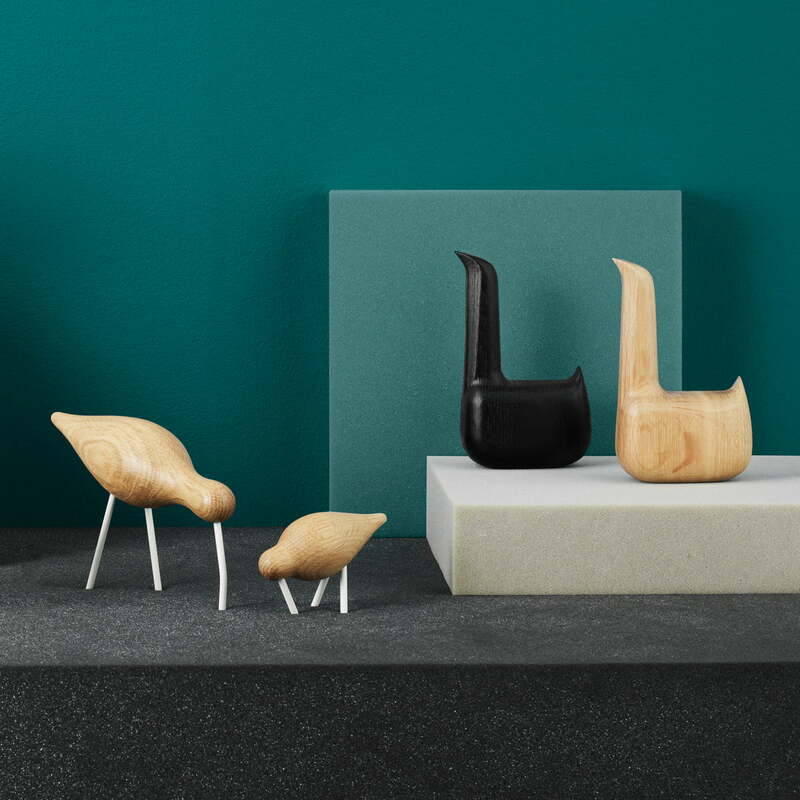 The Icelandic designer Sigurjón Pálsson created a collection with expressive bird sculptures out of oak wood with his Shorebirds. 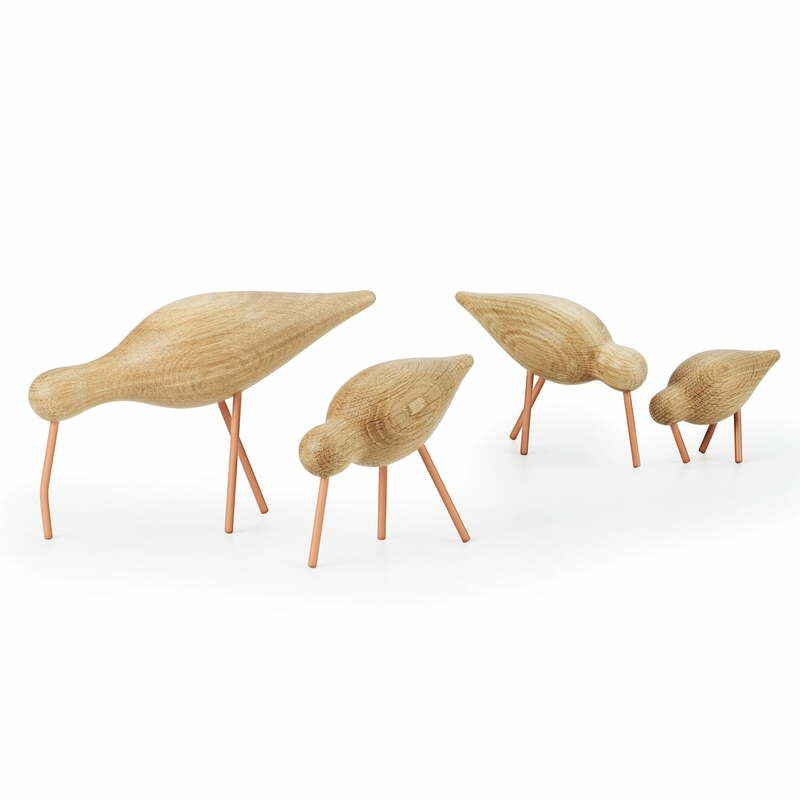 The wooden birds from Normann Copenhagen are made out of massive oak wood. 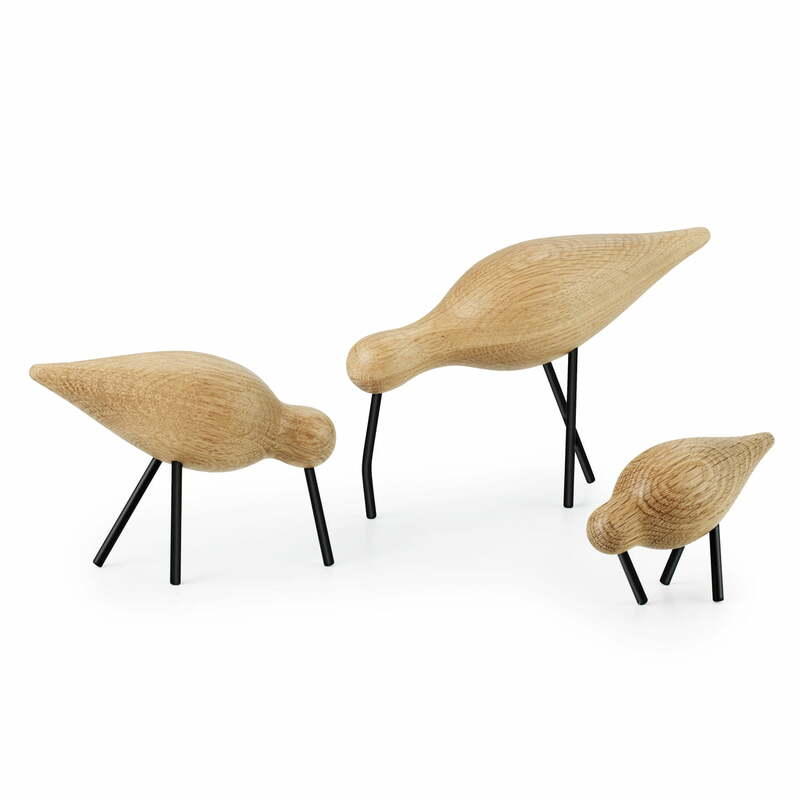 The simple silhouettes of the decoration birds give a nearly stylized expression to the Shorebirds. The small details were simultaneously carefully worked. This is how each one of the three birds has its own personality, keeping the design interesting and vivid. The biggest one of the shorebirds is inspired by the Western curlew, which has a long neck and whose beak is bent downwards. It has a long-legged and aristocratic appearance. It walks around with slow, carefully considered steps and is always on the guard. 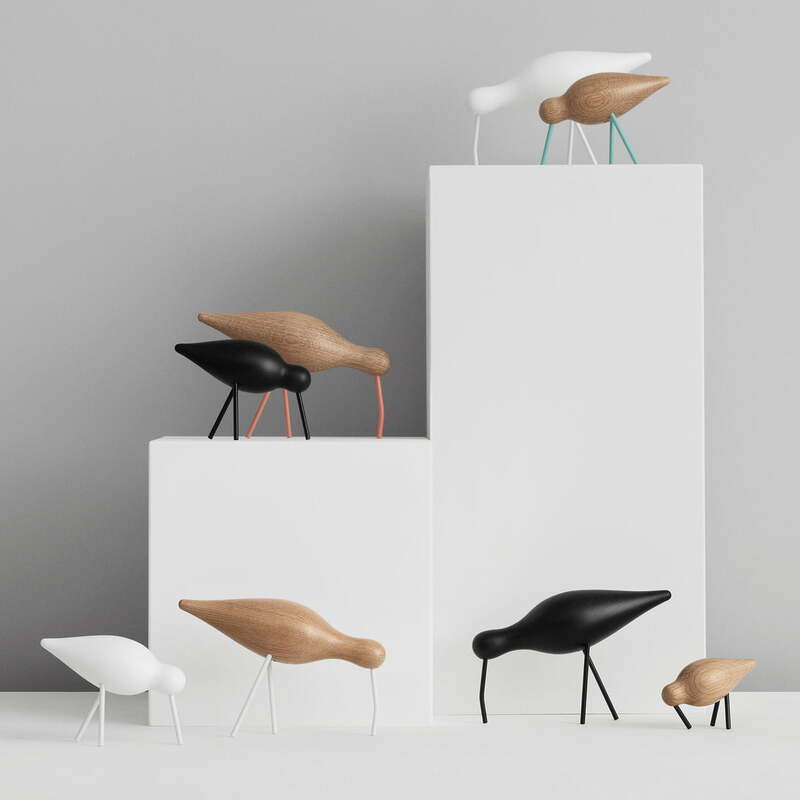 The medium sized bird from Normann Copenhagen is fast and wakeful like a common redshank. These birds often fly together with other wakeful birds. And finally there is the little stint. This one is very sociable and it often appears in big flocks. 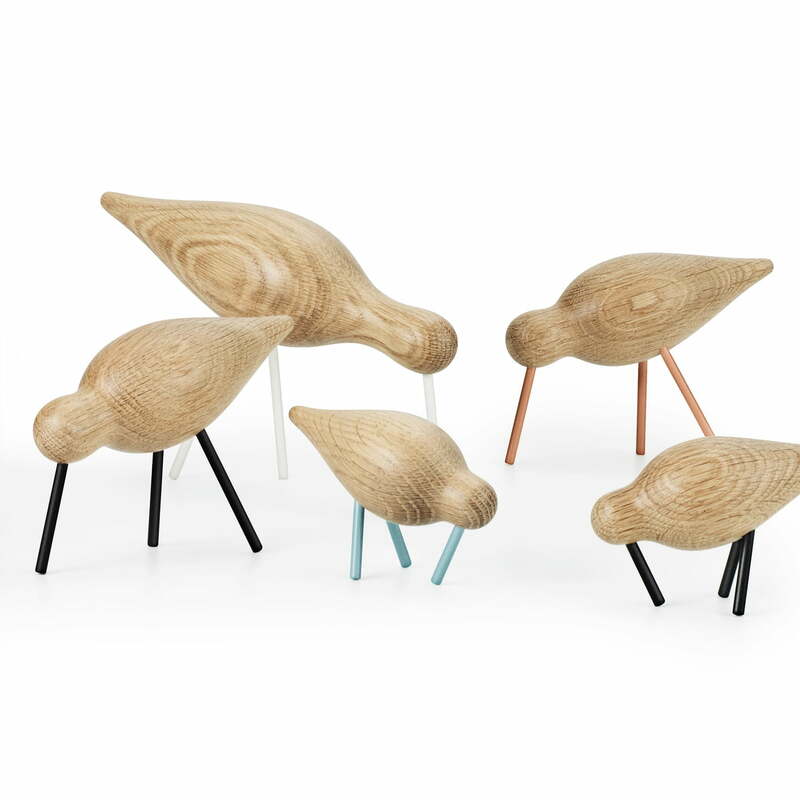 The big Shorebird looks gorgeous on shelves, sideboards or on chests of drawers. There it unfolds its whole beauty standing next to a vase or other decoration items. 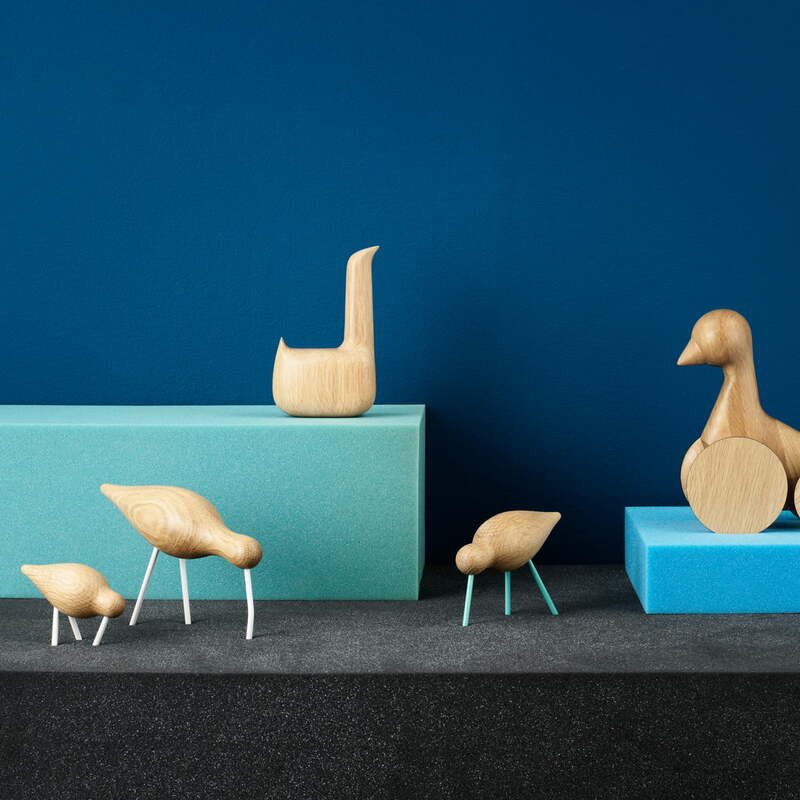 Both smaller birds from Normann Copenhagen ideally appear in groups, where the different sizes and colours make up a stylish and playful impression. Piccolo uccello di legno con zampine in metallo. Qualità altissima e stupendo come soprammobile o anche come ferma fogli. Davvero felice dell'acquisto anche se il mio colore è la versione in legno naturale e gambine azzurre. Molto deluso per il taglio e la forma. Forse il peggiore della serie e non gradevole alla vista. Sono rimasto molto deluso e ho dirottato sulla versione più piccola in diversi colori. 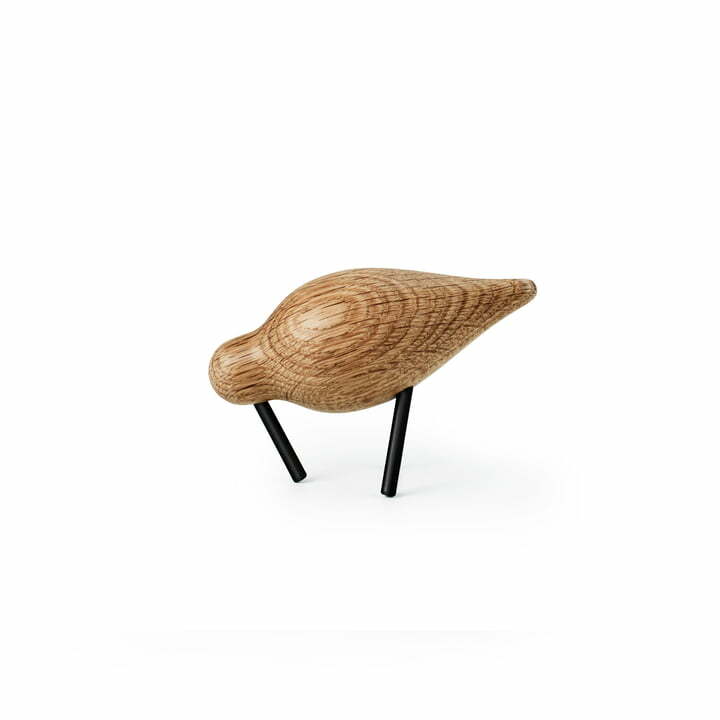 Small wooden bird with metal paws. Very high quality and gorgeous as ornament or even as firm sheets. Really happy with the purchase even if my color is the natural wood version and black legs. The cute and beautiful piece - Buy again. 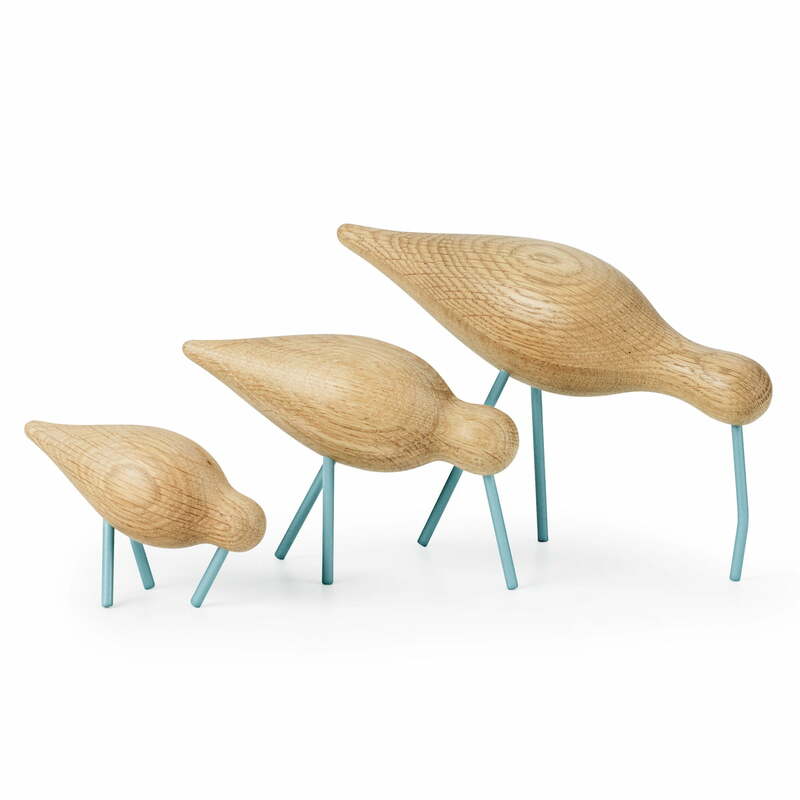 This Shorebird with sea-blue beak and leg is a cute and beautiful piece. It is suitable for any space to be a well decoration. 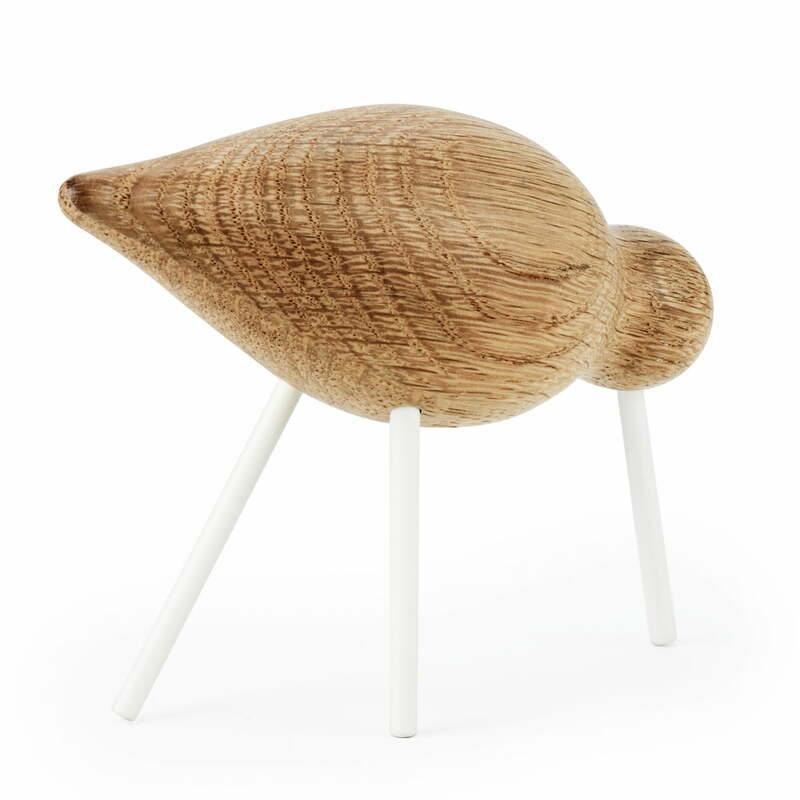 If you have lack of decorated items, this medium shorebird will be the best choice. Mah... Uno scherzo della natura. 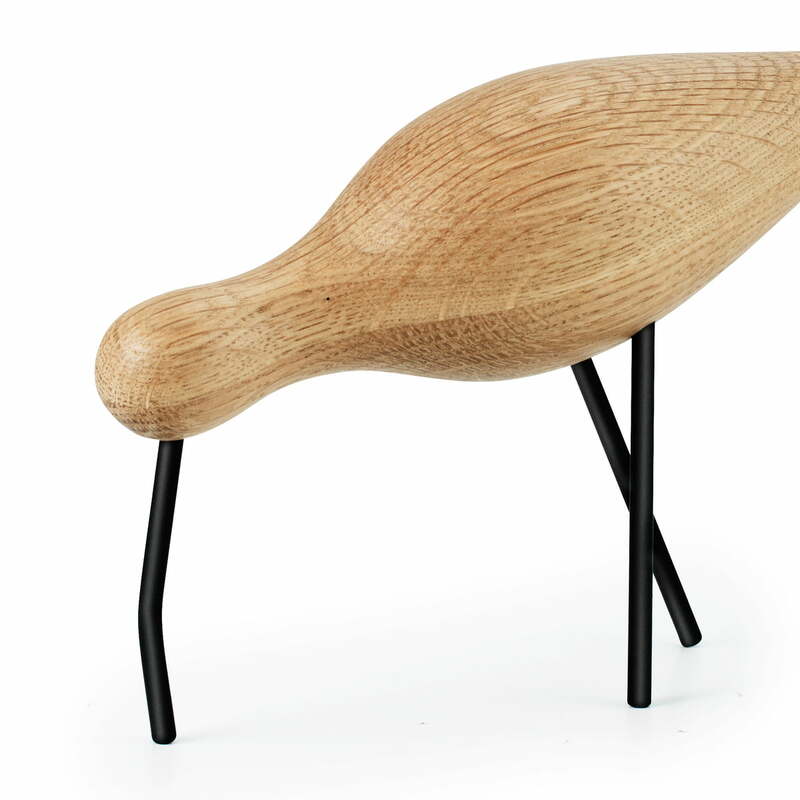 Ho acquistato in passato questo oggetto in legno naturale, pensavo che la versione in bianco fosse smaltato e decorato con un effetto lucido e di qualità alta ma... Mi ritrovo un uccellino con uno strato di vernice decisamente nulla, impronte digitali fissate in fase di realizzazione e a vedersi non ha niente a che fare con gli uccelli di VITRA. Personalmente evitate di acquistare questo colore. 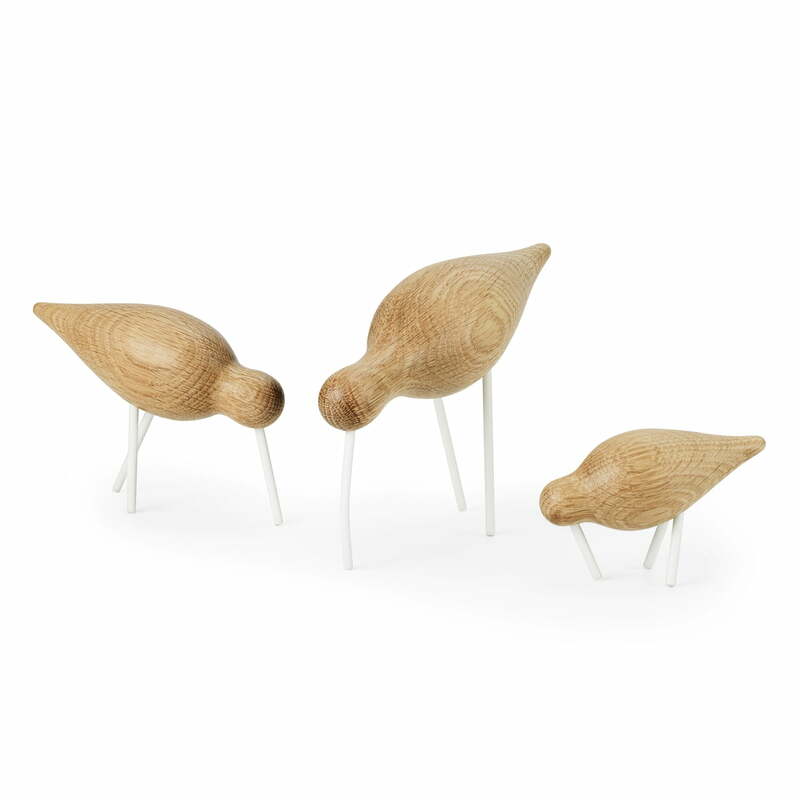 The Shorebirds by Normann Copenhagen are available in three different sizes with bodies made of oak wood and with legs and beaks in white, black or blue paint.